In my previous blog post I shared new and innovative sustainable packaging developments which included mushrooms, wild grass, banana plant fiber and hemp. Pretty exotic and exciting stuff! This is the new normal in packaging. However let’s take a mountain-top view of packaging’s future directions. What will be the direction of the sustainable packaging industry? And more specifically, what will be the trends and areas of growth which will excite packaging leaders and early adopters? Indeed, that is everyone’s burning question. We all wish we had a magic crystal ball, however, leaning on experience from over a decade as a leading innovative sustainable packaging company we have a very exciting view to share with you all. This is our view of what to expect in the coming years. As always, the early adopters will enjoy a wonderful running start over their slower competition. Manufacturing efficiencies continue to improve for recycled papers and are growing across the packaging landscape. The technology and supply of recycled paperboard, boxboard and paper have dramatically improved in recent years. My fellow Green Packaging Group colleagues such as Globe Guard® and Nashville Wraps are great examples. They have continually added more 100% recycled products year after year. The good news is that even larger companies like Staples and New Leaf Paper have joined the fray. Distant Village also uses only 100% recycled boxboard with every box it produces and even started to produce packaging from reclaimed coffee bean burlap sacks too. The shift toward “recycled” sources has unstoppable momentum. It’s soon to be the norm. Over the past few years the focus had been on WHAT is being used for sustainable packaging, the next tier of concern is WHO and HOW eco-friendly packaging is being produced. Furthermore, with Fair Trade products proliferating (such as coffee, sugar, tea, chocolate) along with a focus toward socially-responsible products and business practices comes a movement toward a deeper commitment to social standards. Learn more about innovative social responsibility at Social Venture Network, Rainforest Alliance, and Fair Trade Resource Network. Among certain tree huggers, paper from trees can sometimes carry a bad stigma, right or wrong, even if it is FSC or SFI certified. Alternative plant fibers and tree-free papers are becoming more commonplace. An image of tree-free packaging from Distant Village is pictured here. However, caveat emptor. Be on the lookout for “tree-free” packaging products such as FiberStone® or Rock paper which are made with limestone (without trees), but typically include plastic (HDPE), which is probably not what you expected for a treeless paper product. If and when we trash our packaging, will it really get recycled? Is the packaging material compatible with existing standard recycling systems? 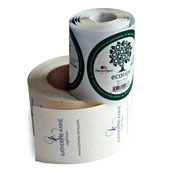 As an example, PURE Labels™, a label sticker which is natural tree-free paper with 100% recycle compatible adhesives, are an excellent and authentic sticker solution. Whatever paper product PURE Labels are put onto can be totally recycled in standard paper recycling systems. Labels without recycle-compatible adhesives render the rest of the packaging non-compatible with paper recycling systems. Did you hear about EcoCradle® Mushroom Packaging made from mushrooms? It is compostable and natural. Check out the inspiring TED video. Expect much more packaging to be compostable. This will accelerate in the coming years, and may be the most profound development in packaging. The sustainability leaders of today will have a competitive advantage over laggards. The days of the packaging industry as a sleepy backwater are long over. Distant Village designs custom handmade sustainable packaging and produces PURE Labels™, a world leading sustainable adhesive label. 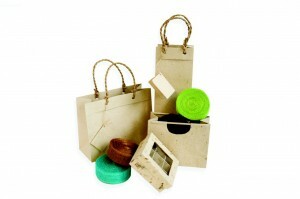 Distant Village produces packaging with an authentic sustainable brand message. Distant Village was founded in 2000 and is a proud member of Green America, Social Venture Network, and Fair Trade Federation.